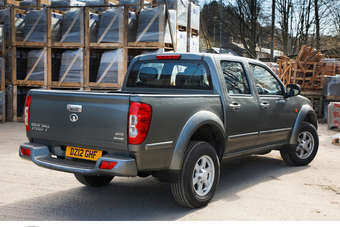 Steed is first Chinese vehicle on sale in UK. As distributor IM noted, will anyone remember who was second? Two minor firsts for me yesterday. A visit to the Motor Industry Research Association (MIRA) proving ground in north Warwickshire where a small off-road workout had been laid out for the new Great Wall Steed pickup - the first Chinese vehicle on sale here in the UK. MIRA's been around a lot longer than Millbrook and is the less flashy version. No posh entertainment centre, just business. The drive to the offroad bit almost dislodged fillings - pickups being prone to a lousy ride unless a decent load of builders' mix is in the back - and I could have sworn we'd crossed at least two more counties before we got there. The Steed looks and feels more late 90s than mid-2000s but it is a far better first-out-of-the-gate than some of the products Japan foisted on the west in its early export days. Sure, the motors were reliable but the bodies rusted, some models didn't like foreign fuel and a lot of early pickup cabs and rear seats were simply far too cramped for burly westerners. It was not till the late 70s that many of the Japanese D-segment cars had the sort of legroom you took for granted in a UK or American equivalent. Importer IM Group - which also does the Isuzu D-Max separately - is pitching the value for money aspect with a simple, very well equipped, 4WD, turbodiesel manual double-cab line and the presentation was free of hyperbole. No grandiose predictions of volume or buyer type - the 40 dealers and a low-key, direct-target marketing campaign will get to work and then we'll see. Some success in right-hand drive Australia and New Zealand, and also in LHD Italy suggests the brand will find its place; leather trim and cheek heaters has to at least guarantee a showroom or farm show look. The Haval/Hover H6 SUV we were shown in LHD form also shows promise; it's about the size of a Qashqai and will also go the turbodiesel, six-speed manual route with an auto option likely at some point. Like the Steed it doesn't appear to set any class standards but if the price is right, the equipment list lavish and the dealer service as good as Great Wall promises, the customers will come. For anyone quick to dismiss the Chinese as johnny-come-latelys, I have two words: Hyundai-Kia. How we laughed at those rebodied Mitsubishis with brown trim that turned green in strong sun. We don't laugh at their products any more, nor those of now-affiliate Kia.